It was recently my mom's birthday. She LOVES coconut. Coconut, macadamia nuts, pineapple..... basically anything Hawaiian tasting, she loves it. I wanted to put together a cheesecake that had all three, but I left it until last minute. So, I focused on coconut because I almost always have coconut in my house. Next time I make this I think I'll add some chopped macadamia nuts to the crust, and make some kind of pineapple syrup for the top. Hopefully that will be a future update here! 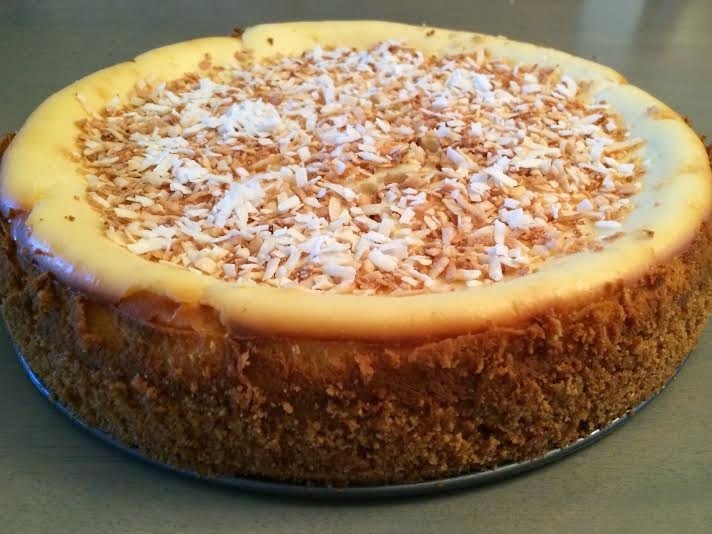 Coconut Cheesecake - serves MANY! This is RICH!! -1/4 cup toasted coconut for topping. Preheat oven to 350 degrees F. Mix together crumbs, coconut and melted butter, and press into a 9 inch spring form pan. Press about 1 inch up the sides as well. Bake for 10 minutes or until golden brown. Start checking at about the 8 minute mark as this will brown quickly. While the crust is cooling, beat the 3 packages of cream cheese (it's easiest at room temperature) until light and fluffy. Add 1 cup sugar, coconut extract and salt and continue beating until smooth. Add coconut cream and cornstarch which has been whisked together with the 3 tbsp of milk. Once thoroughly combined, start adding the eggs one at a time, and beat only until they are combined. Let cool completely in the pan, and then transfer to the refrigerator to chill for at least 4 hours before serving. NOTE: I do NOT bother with a water bath, as is usually the norm while making a cheesecake. I like to top this cheesecake with about 1/4 cup of toasted coconut when cool, which hides any small cracks that may form. Cheesecake is a gamble, even with the water bath. I've had them crack with a water bath, and then not crack at all without the water bath. So I just don't bother anymore. Just have a delightful topping to add and no one even sees the cracks! I only got one picture of this cheesecake before transferring to my mom's house for the birthday. I wish I could have got one of it sliced!